Donna and I met Carri Thurman, who owns and runs Two Sisters Bakery in Homer, Alaska, a year ago fall when she came to introduce herself bearing bread from On the Rise Bakery and some of her own Lilac Jelly. The day was exquisite fall and the jelly inspired a great still life from Donna. And it was a pleasure to meet a fellow blogger and frequent commentor on this site. Naturally, this professional baker was first on the request list for a guest blog during bread baking month. Herewith, Carri Thurman, and a ciabatta recipe that interests me in two specific ways. First, it requires a kind of starter or what some people refer to as a preferment: a little bit of yeast is allowed to ferment for 12 to 24 hours, which gives the dough more flavor. Second, it’s a very slack dough, as much stirred as mixed, and so differs from the standard mix, rise, shape, rise, bake routine. An intriguing ciabatta (photo by Carri). If you make it, let me and Carri know how it goes. “Give a man some bread and he eats for a day, teach that man to bake and…”oh wait, it wasn’t really bread they were talking about was it? Still the moral of the story is there for all to see. I applaud Michael in his efforts to get people to bake bread at home. For us, here at our little bakery in Homer, the power of baking bread comes not just in the selling of the loaf, but in the sharing of the whole experience that created it. With that spirit we have always openly shared our recipes with anyone who requests them; however, the bread formula we are most often asked for is one that until now, I was unsure of breaking down for the home baker. Some very talented people have tried. Their explanations about yeast and hydration percentages make even my eyeballs roll back into my head. Seriously, does it have to be this hard? Do we have to understand the science behind something in order to do it successfully? We grapple with these questions often as we work on our recipes and how to teach them to others. Sometimes you just need someone to tell you what to do. So here you go. 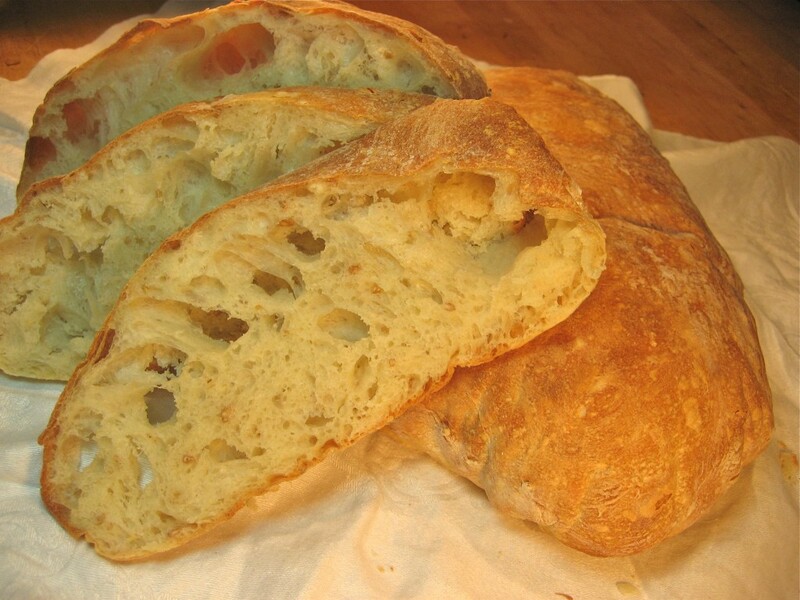 Traditional rustic Ciabatta bread is made with a very wet dough. So much so that it’s better off in a bowl rather than rising right on the counter. It uses a stiff dough starter, mixed the night before, preferably, which is then worked into a thinner wet batter with the addition of water, yeast and a little more flour. Instead of kneading, it only requires a series of ‘turns’, which is basically just reaching in and scraping the dough away from the side of the bowl. Other than time, the fact that you have to fiddle-faddle with it every little while is the only thing that makes this a fussy recipe. The end result is so worth it, you won’t mind having to stir the dough in between paying the bills and walking the dog. This is a perfect bread to make once a week. The result lasts a long time on the counter, (well, at some people’s houses) and can be frozen and reheated to crisp the crust, giving you a loaf that tastes like you just baked it. Combine the grains and tepid water in a medium sized mixing bowl. Cut the starter dough into 6 or 8 pieces and put them in a large mixing bowl. Pour 2 cups/450 grams warm water over it and let sit a few minutes to soften. Feel free to get your hands in there to break it up a bit more. Add the dough ingredents and, using a wooden spoon, beat the mixture together well. It will resemble a stiff pancake batter and appear quite rough, don’t worry about completely incorporating the starter dough. (This can also be accomplished in a stand mixer using the paddle attachment, but I think it comes together better with a wood spoon or paddle). Let the dough sit, covered lightly, in a warm spot. Scrape the dough out onto a well floured surface and fold together lightly. Divide into two equal loaves and either pull apart into a flat focaccia style or fold the two ends into the center, like folding a letter, to form rectangular mound. Place loaves on parchment paper lined sheet pan side by side for final rise, ½ hour to 45 minutes. Prep your oven by preheating to 450 degrees F/230 degree C. and putting a baking stone, or in my case, a cast iron griddle on the middle rack and a baking pan half full of water right on the very bottom. Mine is long enough for both loaves (if you have neither, just bake it right on the pans). When ready to bake, lightly flour the tips of your fingers and dock each loaf, deflating some of the bubbles; don’t worry, it’ll bounce back in the oven. Cut the parchment paper between the loaves to separate, and slide each loaf right onto to the stone or griddle. Bake until dark golden brown and internal temp reaches 200 degrees, approximately 25 minutes. – Cracked wheat berries: I have some wheat berries I picked up that would need to be hydrated, but I think they’re whole, not cracked. Would these be ok? – The pan of water under the baking: how exactly does that work in an electric oven? Bottom rack? Surely not on top of the heating element? – What does “dock each loaf” mean? Crack them in a coffee grinder. They don’t have to be cracked much. Yes, bottom rack in an electric oven, you just want some steam. To dock, just stick your fingers in it to deflate the loaf a little before baking. have fun! Let’s use the more commonly used term “dimple”. You want the dough to look like it has the texture of a moonscape as it goes into the oven … say one fingerprint dimple every inch or so. Press your fingertips down to the parchment on the bottom. If you don’t do this your ciabatta will balloon up like a football in the hot oven. Fantastic post! That’s almost exactly how I make my Ciabatta, except I start with sourdough and don’t need yeast. You can also shape the resulting dough into a ball ( carefully to not let the air out ) and put it into a preheated cast iron pot ( or a cheap clay pot from a chinese supermarket ) and slash the top. bake with the lid for 30 minutes, then remove the lid for an extra 10. Yes, Paul, it’s true anything cast iron will work, if you don’t have a lid, put the pan of water in the oven. Chad from Tartine Bread has people baking bread in open cast iron pans. It’s brilliant. Paul, when how much sourdough (wild yeast) starter would you use and how would you change the recipe above? OK, I will be perfectly honest; this was the bread recipe I was hoping for as my foray into bread baking. Ciabatta is one of my favorites and I will definitely be adding these ingredients to the grocery list I am currently scribing. Thank you! Please double check the weight quantities on your recipe. I can guarantee you that 1 tablespoon full of salt doesn’t weigh 4 oz. that’s .04 pounds. .4 ounces. argh. How about the wheat and rye flour? I’m all but certain 1 tablespoon doesn’t equal 4 ounces in that case too. that’s right. um, emilia…can we change that up? Thanks, Albert! because it’s so small, I’m just deleting the weights on that one. This is definitely on my baking list for next weekend! Could it have something to do with chemically-bleached flour having a lower gluten content? A favorite bread of my family. Would love to try the recipe. Thank you ! Definitely going to try this one. I’ve been making “ciabatta” for years from an Italian recipe and it tastes great, but I’ve never been able to get the big holes that are the signature of real ciabatta. Looking at your method, I can instantly see the difference. About baking terminology: 1) the recipe I have refers to the starter as a biga (in Italian) or sponge. 2) I worked in a deep-dish pizza place for years and we used to dock the dough just before we built the pizzas to keep giant bubbles from forming in the crust. We even had a tool called a docker that looked like a miniature lawn aerator. Ciabatta has long been the bane of my bread baking experiences. While my results have been tasty in the past, I haven’t been able to get the crumb right… I’ve been scared to take the hydration as far as it needs. In any case, I’m inspired to give it another go. Thanks! Does one cover the dough during the final rise? I don’t usually cover once the loaves are formed, though if you need to protect from draft, sprinkle the loaves with flour before you cover them, so it doesn’t stick. I think I’m missing something. At what point when making the starter do you actually add the flour? And are you really only supposed to use 1 tsp of water to 3 cups of flour? Yes, only that little bit is needed. and yes, Chris, you can use the same cup of yeasted water for as many batches as you like. The flour addition seems to have been left out in the translation of assembling the starter. It gets mixed in with the other ingredients to make a firm dough ball. Hopefully we can fix that too. sorry guys! I have the same question as Angie and with the yeasted water that you only use 1t and discard the rest, is it okay to make a few batches and use the same yeasted water for all? I have the same question as Angie and with the yeasted water that you only use 1t and discard the rest, is it okay to make a few batches and use the same yeasted water for all? Sorry, not much of a baker. I love this bread… everything about it!!! will definitely give it a try when i get back to the kitchen next week! Have a nice weekend! After reading the recipe again, I gotta comment on the use of volume measurements. I’m of the opinion that all baking should be done via weight ( and metric at that! ). Volumes of different flours, sugars, salt and even yeasts can dramatically differ from brand to brand. also to those asking about the open crumb my understanding is the reason good ciabatta has a wide open crumb is because of a few elements, the main ones being the folding action instead of kneading and not deflating the dough for a second proofing. ciabatta is a funny bread there’s a ton of really complex recipes for it around the ‘net, yet it’s actually one of the easiest breads to make. Oh Paul, you are so right, though all my weights are in pounds and ounces because the digital scale I had given to me 18 years ago was calibrated that way. I have spent the better part of my time converting those weights to measure as I write recipes for the general public. Because that is the norm, that is how we have to do it. I apologize for not converting this recipe to metric weights…next time. in the starter, is the yeast dissolved in a second cup of water or the measured 1 cup of water on the ingred list? 2 cups of water to 3 cups plus 2 tablespoons flour will make a batter not a dough that can be cut into pieces. 1 cup of water will. the big holes comes from a combination of a very hydrated, quite sticky dough, plus baking at a high temperature with the stone. If the dough is not wet enough, you cant get that particular rise. ciabatta is the apex of the artisan baking world. and most delicious for how simple the ingredients. technique technique technique. E-beth, the yeast is disolved in a second cup of water that is discarded after initial teaspoon is taken. The starter is a very stiff dough. the final bread dough is very wet, which as Nancy Silverton says, the wetter the dough, the bigger the holes. My husband wants you all to know that he styled this photo. He thinks he has a new career. Paul Child has nothing on him! the photo is outstanding. it is not easy to photograph bread. if a baker can master ciabatta, they can make any type of bread with ease, for ciabatta is quite tricky to get just right. It’s just red star active dry yeast, nothing unusual. Trust the process…it works! Michael, would it be possible to also provide metric conversions in the future? Or at least baker’s percentages? The biga for this ciabatta is already sitting on my counter, but even after a conversion I only have a rough idea about what ratios I’m aiming at. I estimated 80% hydration and will try to post result, but still, less guesswork would be welcome. I wanted to make smaller batch and all the reductions and conversions make my head spin. I am working on getting the metric conversions up, but in the meantime, the hydration of the finished dough is 103%. The weight of the water is slightly more than that of the flour. the starter is 57%. Thanks! I had starter at 50, final dough at 90 (so close! ), it’s in the oven and looking good. Just made a ciabatta type bread this week with whole grain flours and flax, sunflower, pumpkin and sesame seeds. I used to be afraid of working with slack doughs but after reading up on them in Daniel Leader’s book, Local Breads, and practicing a bit, they don’t scare me as much. Mine was a bit less open than most, probably because of the wheat and rye flours and seeds, but no less tasty. On thing I do when I bake a crusty bread is use ice cubes instead of water for the steam. Just 3 or 4 in your preheated lower rack pan seems to provide better steam- because they melt slower?- and a deeper crust. I’ve got my starter going! Thanks for inspiring me to make my first loaf of the year one that I’ve never tried making before. My last bread last year was those wonderful English muffins and they turned out beautifully. I love checking in on Saturday morning for inspiration. Bacon, why I cook, blue masking tape!, corned beef, English muffins, hollandaise…Thanks and happy, happy new year! Just wanted you to know that I was disappointed to be sent green checked side towels when the pix showed plain white. They work great but I prefer white. Thx. All this talk of bread convinced me to take out my starter and bake a loaf. Used 500g (bread) flour, 300g Water, 10g Salt, 100g Starter. Mixed flour and water together enough to bring into a ball. Left for 1 hour. Kneaded in salt, then kneaded in Starter. Then every hour I folded the dough to help the gluten along. After about 6 hours I preheated the oven to 450F with a clay pot inside. Shaped the dough into a ball ( being careful not to knock out too much air ) and left in an oiled bowl about the same size as the pot. An hour later with the oven roaring I tipped the dough into the pot and slashed the top and baked for 30 mins lid on, then 10 mins lid off. I made the starter yesterday morning and baked this bread today. I had whole wheat flour but didn’t have the rye flour, so I took a slice of rye bread and ground it down to powder. I know it didn’t need it, but I like giving the dough other grain for the yeast. It sure is a slack dough/batter! I had to use lots of surface flour to be able to handle the loaves. I made a couch of sorts with the parchment to keep the two loaves from melding into one big giant mound of bread and baked them on a half sheet pan. I was still afraid it wasn’t going to rise at all, but the oven spring was really good, and it just popped right up there and looks like any chabatta I’ve ever seen! I think I made a mistake by using a pan of water in the oven to develop the crust. It did make a nice crust, but the bread it so moist I think it may have done more harm than good. Would that keep the crumb too moist, too? I found out I’m very poor at handling such a wet dough 🙂 Anyway, the bread itself is very tasty, great crust, very open crumb (I was expecting even more open though) and tasty, too. I like the lightness of the crumb and was very surprised at the depth of the flavor, it was much less yeasty than I expected. Still have to experiment with shaping though, it came out basically a huge baked dollop of dough 🙂 I will also try to leave out most of the extra steam, I feel like the dough can provide enough evaporation on its own. In summer it can make a great panzanella and it sure is ideal for eating with just olive oil. Thanks! Great Blog! Made the starter last night, very stiff and I was not sure I had done it right, used an old trick of heating a wet towel and mug of water in the microwave for two minutes and then drapping the towel over the bowel for the starter to rise over night. Will do the same to proof the bread in a few minutes (I think leaving the light on ads some heat and the inside of the microwave is draft free). I have a clay “La Cloche” clay bread oven that I will cook the bread in later today. I cook a lot, but have never baked before. Loaf #1 has come out of the oven and is a little doughy. This is a coking time / temperature thing? yes, very likely a time and temp thing. the dough needs to go above 180 inside so that the starch gels and solidifies. Well they are finished baking and (mostly) cooled and one loaf is almost halfway gone already. Some homemade feta cheese went on one slice then I made a nice garlicky mayo and fixed a salami and melted cheddar sandwich. Rave reviews from my husband who wanted to know when I was going to make the salami 🙂 Since Charcutepalooza is under way, I guess it will be sooner rather than later! Fascinating bread. Super easy. I formed them into rolls, ate one, and put the rest in the freezer waiting to bake later. made this turned out excellent will be a recipe I continue to use, thanks so much. I’m having a little dinner party Saturday and have decided to go with an Italian theme just so I have an excuse to make this bread. :D. Thanks for the post! I made this bread over the weekend. The flavor was wonderful, the texture was a little chewier than I expected. This has happened occasionally with other breads as well (such as no-knead bread). Is there something I’m doing wrong? Otherwise it was wonderful, especially lightly toasted and brushed with olive oil and rubbed with garlic. I’ve had the same problem as Darlene – my bread came out a bit chewy. Delicious, but slightly wearing on the bicuspids. My no-knead bread is worse – truly an aerobic excercise for the jaw. It’s like the bread is putting up a fight before giving in to being consumed. Any suggestions? This is meant to be a chewy bread. That’s how it hold the air pockets so well. And I’ve been eating it toasted all week, (from making so many loaves at home to write the post!) and no matter what you put on it, it is fabulous. I’ve been meaning to reply to the bleached vs unbleached flour question for a while, but now I have time. With bleached flour, peroxides are a typical bleaching agent. If yeast are in a peroxide rich environment, there’s a greater chance they’ll metabolize even more sugars, creating more carbon dioxide. This would explain the incredibly inflated dough. They’re just…well…farting more from the bleached flour. I love this, thank you! it will forever be my answer. I love this type of bread! I put the starter together Saturday afternoon, completed the dough last night, so silky and lovely! I then put it in the fridge overnight (Carri, do you foresee any issues with this process?) and will bake it today. I’ll definitely post pics later. On to Rye! I have never tried to retard the final rise. How did it work out for you? Seems to work just great. Life is not always linear, sometimes dough must wait, and this one did fine. I personally wasn’t as happy with the bottom crust, but that is my issue, not the recipes. Carri, you mentioned that you use a cast iron griddle, I am looking for a heat conductor/baking surface for my oven, thought I would get the largest pizza stone I could find, but then read about your cast iron option. Do you have any thoughts of the pros vs. cons? The griddle would be a better multi-tasker. Multitasking is why I used the griddle. Mine is long enough to fit over two burners so it’s perfect for two loaves when sideways in the oven. I think pizza stones are great, too, I just have never found one I was willing to haul home. If you can find a size that fits your oven you can just leave it there all the time, makes anything you bake better. I did it! My bread is done, and it turned out fabulously! i had a little trouble figuring out the directions.. but you cant possibly argue with results. my loaves were just stunning. and delish. someone was wondering about the small amount of yeast? but i’ve seen other recipes where you use a very small amount in the sponge and put a more expected amount in later. it totally worked. i tried with 1/3 whole wheat – worked great. thanks! I followed the directions exactly and I got two wonderful looking and tasty loaves. I toasted a few slices to go with our Sunday night meal of steamed mussels and it was a perfect combination. Thanks for getting me back to bread making with our bread making series. I didn’t realize how much I was missing this kind of rustic bread with big open holes and a bit of tooth until I saw this photo. For whatever reason, a hearty boule at a reasonable price is hard to come by in our neck of the woods. I am now officially inspired to take matters into my own hands and get some of that yeasty goodness partying in my kitchen. The nuances, variations and general wisdom on a thread like this are hugely valuable and confidence building, as well. Thank you! I made this twice. I have to say, use the metric weight measurements. The first time, I used the Volume Method and it was a disaster. The second time, I ended up with the best bread I have ever made by hand. Just great. I made this bread twice. The first time the dough was a bit gooey/runny but I managed to get it baked and it came out good. The second time, it was a runny mess. I added a bunch more flour to it after the final rise and didn’t have time to let it rise again so I just baked it. It still came out good, but not as good as the first time. Is the dough supposed to be that gooey? There was no way I could form it into a loaf or roll. It just oozed around the pan. What am I doing wrong? Btw – you’ve inspired me to bake bread at home. I bake one to two loaves every weekend now. Nothing like freshly baked bread! Try weighing the ingredients, if you can. If you must measure, be careful not to incorporate air into the flour before measuring…no sifting, etc. It should be quite wet, you won’t be able to knead it into a loaf, it’s more like folding. Use plenty of flour on your bread board when you turn it out of the bowl and fold it together a few times before cutting into loaves or rolls. I hope this helps! Thanks for the input, Carri. I did weigh everything but for some reason it’s still wet. So after you fold it on the bread board, does it become workable (meaning it doesn’t stick to everything)? I’ll keep trying till I get it right. Today is the big blizzard so I had a chance to try this recipe. I was certain that I’d have to throw out the starter and try again, but when I woke up this morning, it was nice and spongey, so I proceeded. I used my Kitchenaid to to the mixing this morning and I was really stunned during the rising process – the dough just came to life! I used my little trick for baking baguettes to get the crust crunchy — when I put the stone one the middle rack and begin to preheat the oven, I also put the bottom section of the old broiler pan that came with the stove on the bottom rack, and I let that get screaming hot. Then, when it’s time to slide the bread in, I also slide 12 ice cubes into the broiler pan. Makes a nice crust every time! THANK YOU for this recipe!!! Add my thanks to Carri and Michael for this recipe. Made it yesterday finally and it came out great. But I did misunderstand the starter instructions and made a wet sponge. So my dough was super wet. I didn’t really know how wet or dry it was supposed to be, but when I poured it out on the floured counter, it was clear there was no way to get this blob onto the parchment for the final rise. I worked about another cup of flour into it and got it onto the parchment. After 40 minutes, it was still a fat blob, so I kinda folded the sides over the top (as best I could with it sticking to the parchment) and baked. Still came out a bit flat, but had a great crumb, big holes, and crispy crust. If I were to use instant dry yeast, like the blue saf instant, how should i prepare the starter? Should I follow the same procedure in dissolving the yeast in water and using only a teaspoon? or just use very much less yeast… maybe 0.5%? Hey, Kayenne, you can use the saf the same way as the active dry. I tried both when writing the recipe and there was no big difference. You are gonna love this bread!